So let’s talk about bacon. Apologies to my Muslim, kosher and vegetarian friends, but I’m going to level with you — Bacon is good stuff. Smoky, salty, a little sweet, with an edge that can only be described as “porky”. And the aroma! The smell of bacon frying is one of the most intoxicating scents in the world. It makes your mouth water just thinking about it, doesn’t it? Take that bacon thought and add sweet chocolate and deep, dark, slightly salty caramel and you get the ultimate in guilty pleasures – these bacon salted caramel brownies. Bacon has also become ubiquitous. Whether it’s “home cured pork belly” at a fancy restaurant, or hiding in vegetables, pastas, or chicken noodle soup, bacon has become the it ingredient. It’s even showed up in desserts — the maple bacon doughnut at Voodoo Doughnut in Portland, Oregon was probably one of the earliest examples, but a quick browse through Tastespotting will reveal recipes for bacon brittle, bacon snickerdoodles, bacon cupcakes and even bacon macarons. I wish I could be all foodie snob and turn up my nose and say “Bacon is so DONE. It doesn’t actually go with EVERYTHING,” but the truth is that I, too, have been seduced by the beast. You may have noticed bacon popping up in recent and not-so-recent recipes, but I have never crossed into the dark side to feature bacon in a dessert. 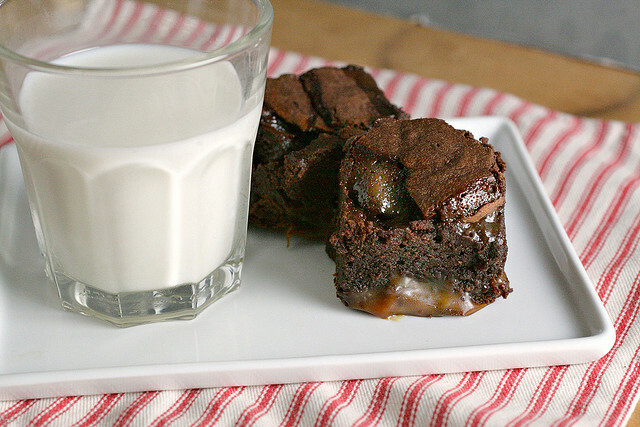 Bacon Salted Caramel Brownies. You may be skeptical. I was. Bacon in a dessert? And a chocolate dessert? Bacon doesn’t make EVERYTHING better. But my friend Rebecca happened upon this particular flavor combination when a colleagues dulce de leche brownies were put into a lunchbox with a bacon sandwich, and the aroma of the bacon flavored the brownies. “You must make these,” she said. And the idea struck a chord in my mind. 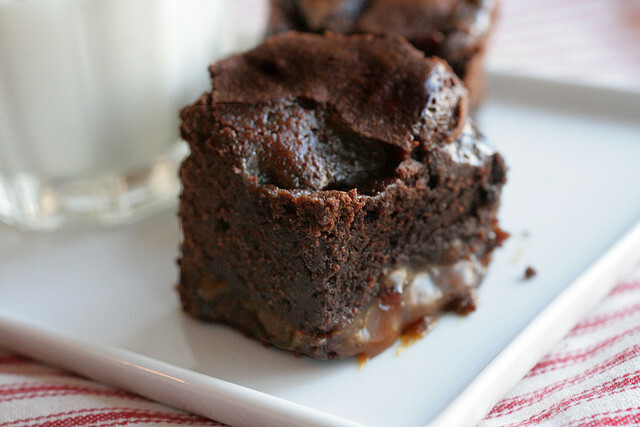 Bacon Salted Caramel Brownies. Maybe it was a Twitter chat hosted by Scharffenberger chocolate, or a girlfriend telling me that David Lebovitz had told her that if she were going to try any one of his recipes, it should be the Dulce de Leche Brownies, or Alice Currah’s Bacon Caramel Bar recipe, but Bacon Salted Caramel Brownies appealed to me, and I couldn’t get them out of my head. I started by frying some bacon, with its crisp crackle in the pan. And then I added it to my favorite salted caramel recipes, and infused the caramel with the scent and flavor of the fried rashers. And then I added the bacon (although it was all I could do not to eat the caramel covered bacon all on it’s own. And then, I made Mr. Lebovitz’s excellent brownies recipe, and added thick, rich dollops of salty, sweet, slightly bitter caramel, all suffused with the smoke and meatiness of bacon. These aren’t just brownies any more. And they’re not a novelty dessert. They’re something else entirely. In a small saucepan, fry two slices of bacon until crisp (I find it’s easiest to do this when the bacon is cut in half). Remove bacon, set aside, reserving bacon grease in the pan. Add cream to hot pan and let cool. When bacon is cool, crumble or chop finely. Line an 8 inch square pan with two sheets of aluminum foil that covers the bottom and sides of the pan. Grease the foil with butter or a little Baker’s Joy. In a large microwaveable bowl, melt the butter and the chocolate together in the microwave (start with 30 seconds, and stir thoroughly, then microwave for 10 seconds at a time, stirring between each bout of nuking, until the chocolate is melted and incorporated into the butter) (You can also melt them together over the stove). Add the cocoa and whisk until smooth, then add in the eggs, one at a time, and the sugar, vanilla and finally the flour. Stir only until combined. Scrape half of the batter into the prepared pan. Then drop about a third of the bacon caramel, evenly spaced, over the brownie batter in the pan. It doesn’t have to cover the whole batter, but should be in splotches. Spread the remaining brownie batter over the top, then drop spoonfuls of the remaining caramel sauce over the top of the brownies and swirl. Cut into small pieces and enjoy the gooey, salted caramel bacon goodness. And a housekeeping note, congratulations to Carole, #45, the winner of the Auberge of the Flowering Hearth. Check your email, Carole! These brownies are over the top! Oh my word! Those look so amazing I am drooling all over the keyboard. Sorry about that. I’ve never used bacon in dessert either, though I’ve had it at restaurants. Those look ooey gooey chocolaty, salty, and delicious! The girls at my book club are always poking fun of me for bringing bacon-wrapped something-or-other every month. I’m totally making this for next month’s book club. It looks FABULOUS, and they will crack up that I’ve managed to dig up a recipe for brownies that includes BACON. Kate – Just stopping by to say I love your blog. Thanks for your help with my feed questions via food blog forum. I like the length of yours and the way you handle the transition. Hopefully I’ll get mine sorted out. Scrumptious. My hubby will be into these, I can tell you and it will be a fine showcase for some of our homecured pancetta! OMG! I can’t wait to try this! I too love the smell, the taste, and just the thought of bacon. I included the link to my interview with an executive chef whose menu might as well revolve around pork. I’ll have to send him over to this page:) Thanks for sharing! This sounds so good! The combination of salty and sweet is one of my favorite flavor combos — not to mention I LOVE bacon. Hope to see you on Saturday! I made these last night. They’re delicious, although I didn’t quite achieve the pretty swirled look. I just knew, given how fast I go through bacon chocolate bars, that these would be a hit! Thanks for the recipe!! Oh my, this looks *fabulous*! Lindsey @ Great Full Day blogged about dark chocolate bacon caramel brownies, and when I google-image searched, your post came up — I hope you don’t mind that I’ve shared two of your pics here, with credits + a link to you! Tried these today! I made them into little mini cupcakes for a cookie/dessert exchange at work! A new adventure in savory/sweet food combinations! These were a huge hit. I admit it was difficult to resist eating the bacon caramel by itself. My kids turned up their noses at the thought of such a combination but now there’s more for me. Next time, I may double the recipe. I love bacon, the way it tastes and smells, and I like it especially when it’s smoked, but I’ve never made bacon as part of a dessert, because I usually don’t mix sweet and salty. Nevertheless, these brownies looks delicious and I have to try it. Thanks for sharing this recipe! Fantastic website. Plenty of helpful information here. I’m sending it to a few pals ans also sharing in delicious. And naturally, thank you to your effort! My girlfriend asked me if I had made these, after I shared your blog with her. I said that I had not, but I would when she came to visit me. That day was today, so I made these this morning for her and her family. Big hit! We took them to the beach with us, so they were warm and gooey by the time we ate them and that was just perfect. Thank you! Finally! Someone who uses baker’s chocolate and not brownie mix! Thank you! Moving on, I have made similar versions without the caramel using maple bacon and subbing some of the butter for bacon grease, then topping them with smoked sea salt. Amazing. I have to try the salted caramel version though. salted bacon caramel? that sounds just unbelievable! I tried making these today and had a complete failure! I’m known for being a good cook/baker, but this one is not for me! Sounded wonderful, though. Candy – I’m so sorry to hear that! 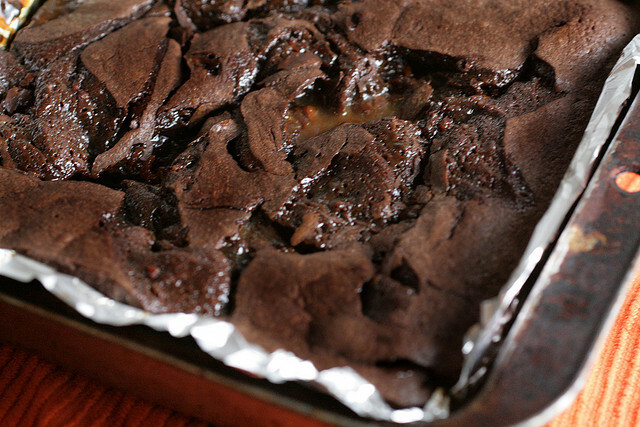 What didn’t work for you – was it the caramel, or the brownie recipe itself? I was very excited about making these brownies. As caramel brownies they are excellent. As bacon salted caramel brownies, they fell quite a bit short. While there may be bacon in there, one cannot taste the bacon — even a hint. Going to try again with a different bacon. A little confused with step 2. Do I heat the suger by itself? I think I’m missing something!